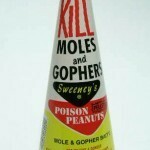 PRODUCT DESCRIPTION: Sweeneys Original Poison Peanuts kill moles and gophers. Simply sprinkle Sweeneys onto the mound or in the tunnel. 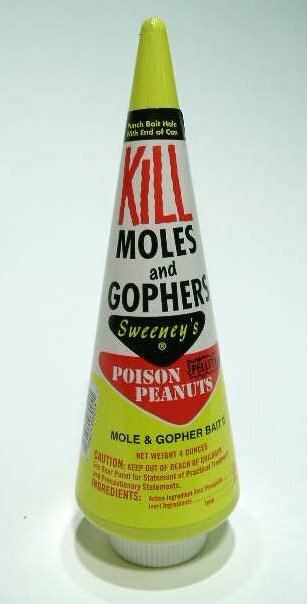 Contains pelleted Zinc Phosphate. WHERE TO USE IT: In Burrows. RATE OF APPLICATION: Place about a teaspoon every 10ft in burrows. Peanuts are very effective! I had a very persistant ground hog. His tunnel put 3 full buckets of dirt on my side of the fence. I placed a small handful of the peanuts in the tunnel outlet. 3 days running and no more problem.